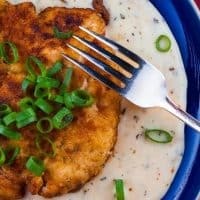 Fried Chicken Cutlets with Gravy | Better than Grandma's Fried Chicken! This is a guest post by Jane Bonacci from The Heritage Cook. She’s teaching us how to make fried chicken cutlets with herb gravy! It doesn’t get much better or more homey than breaded chicken cutlets fried golden brown and served with a savory milk gravy. Let’s get to it! This post contains affiliate links. For more information, see my disclosure page. 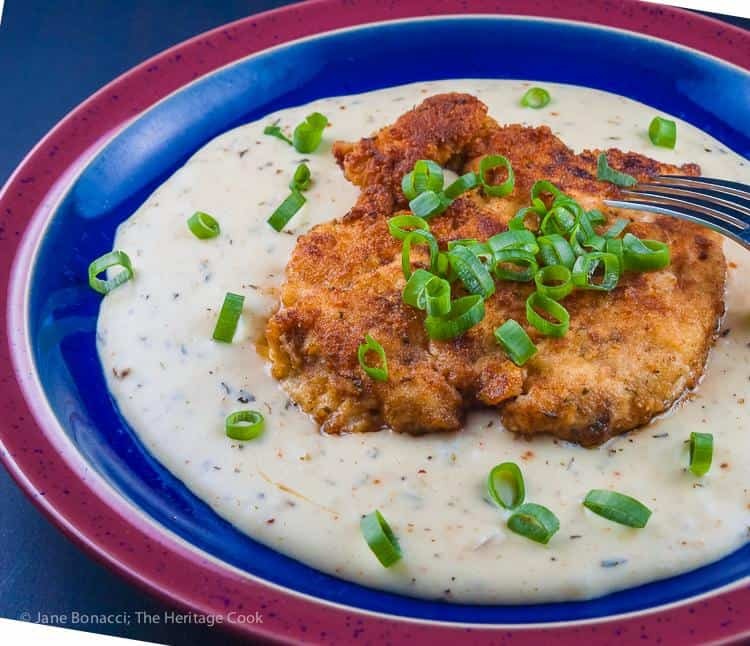 Fried Chicken Cutlets with Herb Gravy pays homage to my grandmother. This is very similar to Mimi’s fried chicken with cream gravy, but a bit easier and a lot quicker to make. I have always loved fried chicken, especially when cooked in a cast iron skillet by my grandmother. She would pack the skillet with chicken and then we would have to wait for what seemed forever until it was done and ready to eat. It was agonizing. Contrary to popular tradition, we never use buttermilk in our fried chicken. Mimi was from Indiana and I think it is the difference between Midwestern and Southern styles. I prefer the simple preparation Mimi taught me. 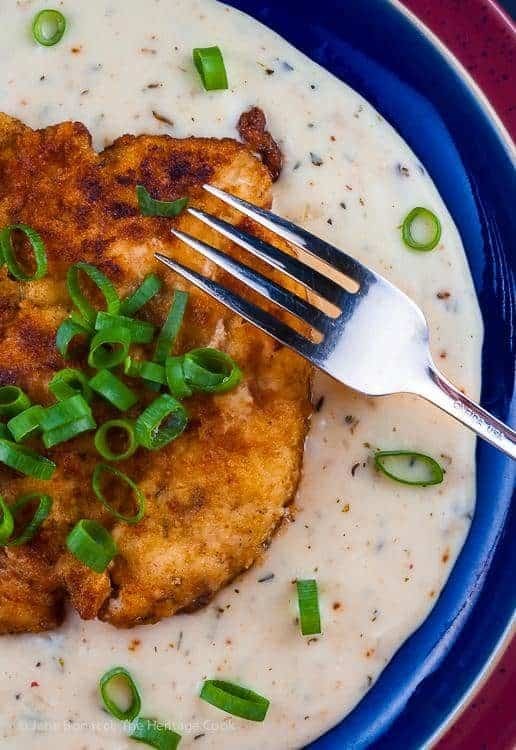 Lightly breaded and fried chicken cutlets with creamy herb gravy is comfort food you can feel good about making. And eating! Mimi’s seasoning was never more than just salt and pepper and she used a lot of vegetable shortening, so much that the chicken was submerged halfway in the fat. 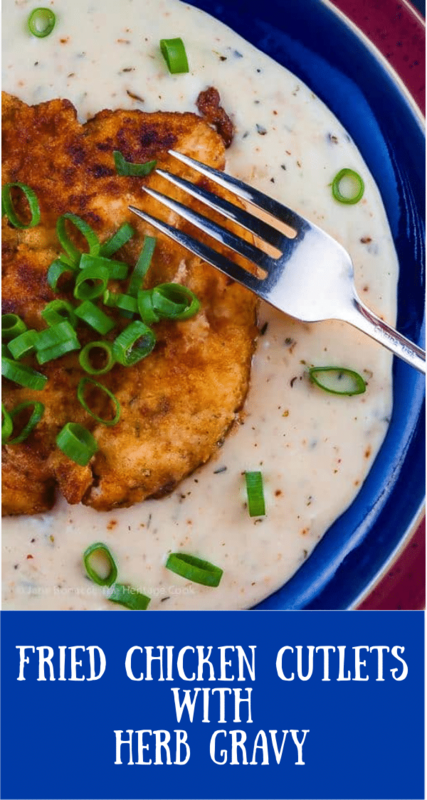 I wanted to make a dish that was reminiscent of my childhood memories, but better tasting, a bit healthier, faster to make, and with touches that make it my own: fried chicken cutlets with herb gravy. 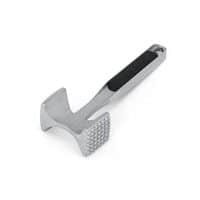 Prep all ingredients–the main things to remember are to mince the garlic and the onions and to pound out the chicken breasts with a meat mallet or meat pounder. 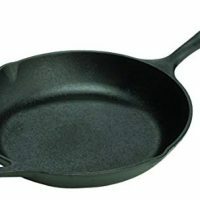 Heat oil and butter in your cast iron pan (or other heavy skillet). Cook aromatics (shallot and garlic). Add flour and cook. You are making a roux by cooking together the fat already in the pan with some flour. Add liquids and cook some more. Set out two wide, shallow bowls: one with beaten egg and one with the breadcrumbs. Season the crumbs per the recipe (or however you like) and stir together well. Dip pounded breasts first into the egg, allow excess to drain, and then dip into the breadcrumb mixture, coating well. 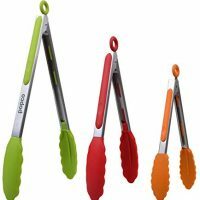 If you do a lot of breading and frying (or oven frying), consider purchasing a breading station so you’ll have dedicated tools for breading your foods. Optional: Let the chicken cutlets sit out for about 10 minutes so the egg and breadcrumb layers can bec0me one with each other. 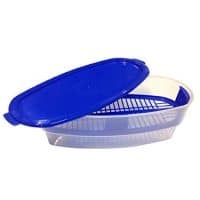 This will help to keep the breading on the chicken where it belongs and not in the bottom of the pan. Heat butter and oil in your skillet, then use tongs to add the chicken. Don’t crowd the pan, so cook in batches or use 2 pans. Cook until golden brown, then flip. Cook until chicken is cooked through, about 10-12 minutes. Shoot for 165F on an instant read thermometer. Whisk the browned bits from the pan into the warm gravy before serving. The browned bits are called fond, and there’s a ton of flavor there, so don’t skip this step! When serving batter-fried foods with gravies, it is best to put the gravy on the plate first and then set the fried food on top. This helps keep the coating crunchy. Rather than pounding out chicken breasts, buy a pack of chicken tenders and pound them out just a bit. You’ll cut your frying time by about 4 minutes, and on a busy weeknight, every minute counts! I hope you enjoy this taste of my childhood. Enjoy! Digging the idea of the fried cutlets? Try these easy and comforting chicken recipes on for size! Note these next sections. Jane adds these into all of her posts. Tips and Hints as well as Gluten-Free Tips both make that much easier to follow her already very clearly written recipes. Yay! Make the gravy before frying the chicken. This may seem backwards, but it is doubly beneficial. By making the gravy first and keeping it warm, the chicken is piping hot when you serve it. Stirring the remaining butter and browned bits after frying the chicken into the gravy gives you the same flavor as making it the traditional way. All the benefits with none of the hassle. You can use your standard gluten-free flour blend to make the gravy or any individual gluten-free flour such as rice, amaranth, cornstarch, potato starch, arrowroot, etc. Some gluten-free flours require more liquid than others, so add more chicken stock as needed. Jane has an excellent post on making your own gluten-free flour blends on her site. Do give it a read! Love the sound of these chicken cutlets? Consider rating them! Thanks! © 2018 Jane Bonacci, The Heritage Cook. All rights reserved. More flavor than grandma's original in less time? Yup! 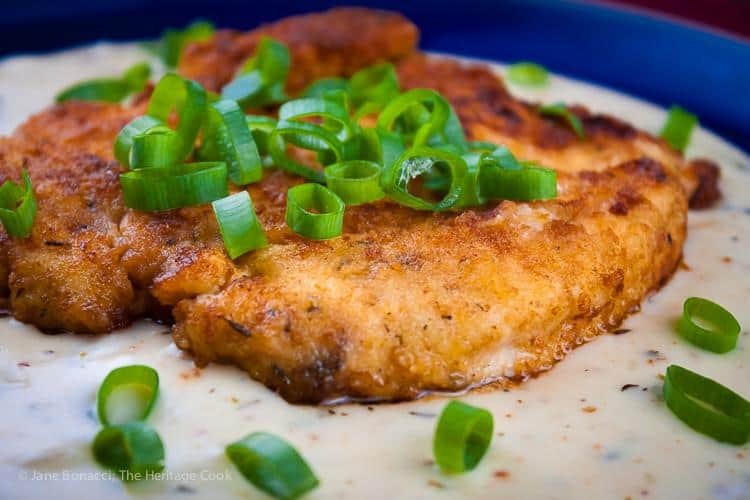 You will love these fried chicken cutlets with herb gravy. Make Sunday dinner any night of the week! Heat the butter and olive oil in a large saucepan over medium-high heat. When the oil is shimmering, add the minced shallots and thyme and reduce the heat to medium. Cook until the shallots are softened. Add the garlic and cook another 30 seconds or until the garlic is fragrant. Add the flour and whisk until smooth with no lumps. Cook for about 2 minutes or until the flour no longer smells raw, but has not browned, whisking constantly. Slowly pour in the stock, wine, and cream, whisking constantly. 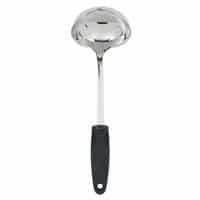 Continue cooking, whisking until thickened and creamy. Add salt and pepper to taste. Keep warm. 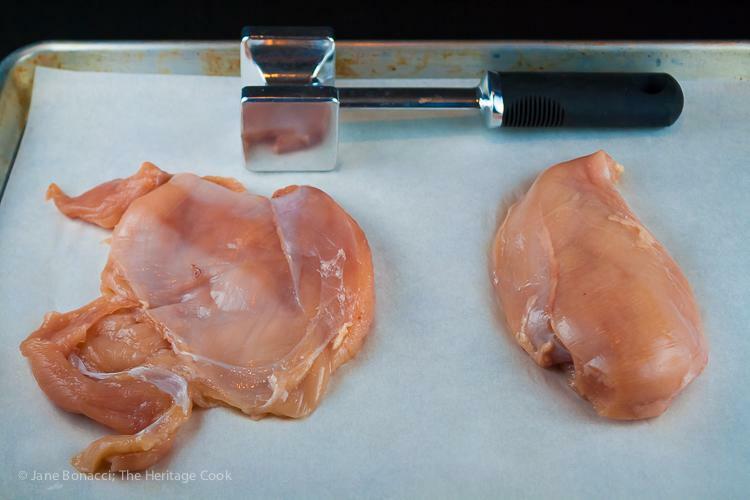 Place each chicken breast, one at a time, in a resealable plastic bag and pound with the smooth side of a meat pounder until it is all one thickness. If your breasts still have the tenders attached, you can remove them prior to pounding the breasts and cook them separately. When flattened, transfer breasts to a baking sheet. Continue with remaining chicken pieces. Place the breadcrumbs in a shallow, flat dish (a pie dish works well) and season with the thyme, salt, and pepper. In another shallow dish place the beaten eggs. Set both containers next to the baking sheet. Dip the pounded chicken breasts in the beaten egg and then in the seasoned breadcrumbs. Shake off any excess and set back on the baking sheet. Repeat with the remaining chicken pieces. In a large skillet, heat the butter and oil together over medium heat. When the butter is melted and the oil is hot, use tongs to add the chicken to the pan. Make sure to leave some room between the pieces so the butter and oil can brown the edges. Cook in batches if needed or use a second pan. Cook until well browned on the first side, then flip and cook the second side. Continue flipping occasionally, cooking until the chicken is cooked through. The timing will depend on how thick the chicken is and how hot the pan is. Mine took about 10 to 12 minutes to be cooked through. Transfer to a baking sheet and keep warm in a low oven while you finish cooking any remaining chicken. When all the chicken is cooked and has been transferred out of the pan, scrape any remaining butter and browned bits into the gravy. These browned bits will add tremendous flavor to the gravy. Whisk until everything is incorporated. 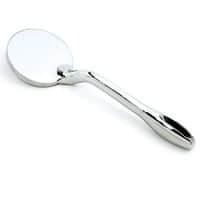 Use a ladle to pour some gravy onto each serving plate, swirling it to spread it out until it is slightly larger than the cutlets. Place a cutlet on the pool of gravy and sprinkle with the green onions. Serve immediately. Sounds great, right you guys? I cannot wait to make this chicken, y’all. That creamy, herbed gravy and crispy breaded and fried cutlets? Yes please! I’m also thinking one could turn this into a sandwich by using a judicious amount of the gravy as a spread for the bread. Yowza. And don’t forget to check out Jane’s cookbooks on Amazon! I cannot tell you how hungry this photo makes me. 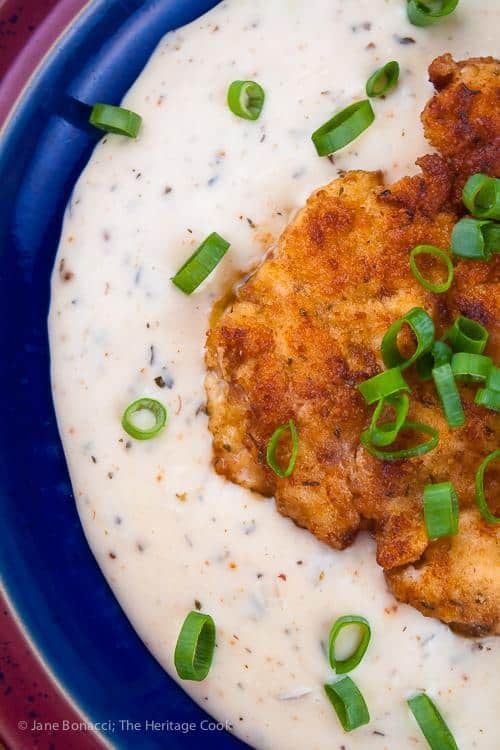 These breaded chicken cutlets with creamy, delicious gravy are in my near future! I really hope you guys give these breaded chicken cutlets with herb gravy a try. They sound perfect for these cold winter days where we crave comfort but don’t always have hours to make a slow-cooked dinner. Jane’s tastiness to the rescue! Thank you for spending some time with me today, and please remember to check out Jane’s blog, The Heritage Cook. I know you’ll love what you see! Take care, and have a lovely day. Made this tonight and it was wonderful! I made the chicken only for two but all of the gravy and served with German egg noodles. And broccoli. I love schnitzel, husband love gravy, we were both happy. Thank you Jane and Jenni. This is the best! I’m so glad you and your husband enjoyed it, Carlin! I will share this with Jane as well–she’ll be so pleased! I LOVE Jane’s recipes, she is such a sweetheart. I can’t wait to give this a try! Isn’t she the best?! And these cutlets? Dang! Dang that looks so good. And the gravy… swoon!! !